B B 6 (1968) The gas screw B B 6 burned August 3, 1968 at the Alitak Cannery at Alitak. B B P 14 (1961) The 8 ton 30 foot wooden gas screw fishing vessel B B P 14 was consumed by fire October 16, 1961 at Dillingham. B C CLIPPER (1969) The Canadian halibut fishing vessel B C Clipper exploded and burned August 1, 1969 off of Twoheaded Island near Kodiak. A liquid gas line from the galley freezer broke and caused the initial explosion when the gas was ignited by the galley stove. Winston Tucker of Vancouver BC, his son Clarence Tucker and Charles Stanley of New Westminster BC were lost. Five others survived on an overturned life raft until rescued by the fishing vessel Peggy Jo. B D CO NO 2 (1940) The 54 ton 60 foot wooden scow B D Co No 2 foundered 70 miles SSW of Cape Etolin October 12, 1940. There was no one aboard the vessel at the time of the casualty. B D CO NO 7 (1947) The 67 ton 60 foot wooden scow B D Co No 7 stranded and was lost in the fall of 1947 on the shore at Cape Suckling. B F NO 9 (1948) The 46 ton 60 foot wooden scow B F No 9 stranded and was lost September 21, 1948 between Crooked and Near Island adjacent to Kodiak. B J (1982) The fishing vessel B J capsized in heavy weather May 21, 1982 near Hinchinbrook Island 25 miles southwest of Cordova. The only person aboard was rescued. B M CO NO 2 (1937) The 321 ton wood barge B.M. Co. No. 2 was lost with almost all of her 20 tons of cargo on June 1, 1937 when she broke loose and stranded on Hinchinbrook Island, 30 miles east of Cape Hinchinbrook, in a heavy gale. She was being towed from Anacortes, Washington to Alitak, on the south end of Kodiak Island, with a load of fishing gear, lumber and oils valued at $6,500. Captain Parker of the Shively Tug Boat Company of Seattle was at the helm of the Georgia which was towing the B. M. Co. No. 2 when her tow line broke in a 75 mile an hour gale. The barge, valued at $10,000, was a total loss but some of the cargo was salvaged. Additional Information: Vessel Insurance $5,000, Cargo Insurance 5,668, ON 227414, Owner Suryans Inc. Anacortes, Washington. Sources: 1. U S Customs Wreck Report, 2. The H W McCurdy Marine History of the Pacific Northwest (1966) Pg 458. B T CO NO 4 (1944) The 59 ton 75 foot wooden gas screw B T Co No 4 foundered in the Gulf of Alaska July 18, 1944. B & W NO 1 (1956) The 188 ton 100 foot steel oil screw B & W No 1 stranded and was lost September 29, 1956 approximately southeast of Mekoryuk on Nunivak Island in the Bering Sea. BAB (1972) The 103 foot steel barge Bab stranded and was lost January 13, 1972 at Cook Inlet. BABS (1968) The oil screw Babs foundered and was lost September 16, 1968 in Cook Inlet near Anchorage. BADGER (1958) The 19 ton 39 foot wooden gas screw fishing vessel Badger was destroyed by a tidal wave July 9, 1958 in Lituya Bay. An earthquake caused land and glaciers to shift and generated the largest tidal wave ever recorded. Damage reached as high as 1,720 feet in parts of Lituya Bay. Large waves between 30 and 200 feet were observed by the two vessels in the bay whose crews survived the disaster to tell of it. A third vessel was lost with two crewmen. BALCLUTHA (1904) According to a wreck report filed May, 25, 1904, the 1554 ton American ship Balclutha struck a reef in the Geese Island Strait at 12:00 p.m. on May 16, 1904 and became a total wreck. She had departed San Francisco the 27th of April with 80 fishermen, 20 crewmen and a cargo of cannery supplies, sheep and cattle bound for the fishing port of Karluk, Alaska. The report, signed by her master, B Bremar of San Francisco, mentions the cause of the casualty as “unfamiliar waters, struck reef…foggy and misty, dark….heavy sea running.” “When vessel struck bracing all yards aback to back her off, but in vain.” The vessel was abandoned with no loss to crew or passengers. Further research reveals that the wreck was acquired by Alaska Packers Association who successfully floated and towed her to Lazy Bay. The Balclutha was then patched and returned to San Francisco where $30,249 was spent in repairing the damage to her hull. She was renamed Star of Alaska and returned to duty in the north. Additional Information: Age 18 years, Registered Port Gamble Washington, Owners Pope and Talbot of San Francisco, Signal letters KQTL, Length 256.3, Breadth 38.5, Depth 17.5, Built 1886 Glasgow Scotland. Sources: 1. U S Customs Wreck Report of May 25, 1904, 2. Salmon From Kodiak (1986) Pg 210, 3. Safeguard the Gateways of Alaska (1918) (Map), 4. The H W McCurdy Marine History of the Pacific Northwest (1966) Pg 423. BALD EAGLE (1992) The 37 foot vessel Bald Eagle parted a mooring line during a storm and was lost on the rocks at Mill Bay Beach on September 28, 1992. BALTO (1957) The 14 ton 37 foot wooden gas screw fishing vessel Balto foundered March 6, 1957 in Valdez Arm. BANSHEE (1977) The 11 ton 29 foot wooden gas screw fishing vessel Banshee stranded and was lost during 1977 on Kodiak Island. BARBARA (1965) The 12 ton 29 foot wooden gas screw fishing vessel Barbara burned August 15, 1965 at Naknek. BARBARA (1994) The 31 foot halibut longliner Barbara flooded her engine room from a broken fish bin and sank June 8, 1994 in the Shelikof Strait approximately 10 miles south of Karluk. All three crewmembers were rescued by the fishing vessel Victoria Ann. BARBIE ISLAND (1982) The 42 foot gillnet fishing vessel Barbie Island broke apart in the surf and sank September 16, 1982 near Sudden Stream 25 miles from Yakutat. The vessel was attempting to depart the steam mouth with a load of late salmon when it encountered large seas that first broke out the wheelhouse windows and soon washed the house completely off, sinking the vessel. Only two of her four crewmembers survived the disaster. Lost were skipper Paul Pavelick and crewman Tony Yanochex. Survivors Bob Young and Al Puttrese were able to last two days clinging to a hatch cover. They made landfall near Point Manby where they were rescued and taken to Yakutat and then Seattle for treatment. BARCONI (1993) The 44 foot salmon seiner Barconi burned to the waterline and sank August 7, 1993 at Flat Island near Seldovia. All three crewmembers made it to safety. BARGE 221 (1974) The 1,255 ton Barge 221 foundered in the Gulf of Alaska October 13, 1974. BARRACUDA (1963) The 10 ton 36 foot wooden gas screw fishing vessel Barracuda stranded and was lost February 7, 1963 at Split Rock near Ouzinkie. Two persons on board; Agnes Stump and Mike Brehken washed overboard and were lost. Skipper Lucky Eckenburg was the only survivor. He walked the 10 miles of rugged beach back to Kodiak surviving his third shipwreck. BDL (1920) The gas screw BDL is reported to have been lost sometime in 1920 at Strawberry Bay near Katalla. BEACHBOY (1978) The 58 foot vessel Beachboy foundered December 12, 1978 in 20 fathoms of water near Two Headed Island. Two survivors were found two days later. BEAR (2011) The 52 foot Homer based fiberglass halibut fishing vessel Bear grounded and was lost near Aniakchak Bay August 30, 2011. Skipper and owner Patrick McBride (31), Kirk Vandoren (48) and Garrett Doktor (22) abandoned ship in survival suits to a liferaft and were rescued by a U S Coast Guard MH-60 Jayhawk and flown to Kodiak. BEAR BAIT (1965) The 10 ton 33 foot wooden gas screw fishing vessel Bear Bait was destroyed by a storm December 1, 1965 at Uyak. BEAVER (1990) The 65 foot wooden fish tender Beaver grounded and was abandoned May 1, 1990 near Kodiak. There was no loss of life. BECCA DAWN (1999) The 52 foot steel longline halibut fishing vessel Becca Dawn rolled and sank in rough weather November 9, 1999 near Port Chatham. Three of the four crewmembers were rescued by a U S Coast Guard Helicopter and taken to Yakutat. Lost was Olen Nash (21) from Haines. BECKY (1973) The oil screw Becky foundered and was lost June 27, 1973 in Bristol Bay. BELUGA (1997) The 17 foot pleasure craft Beluga lost power, stranded on boulder sized rocks and was abandoned May 9, 1997 on Cheval Island, Resurrection Bay. All four persons on board were rescued by U S Coast Guard Helicopter. BEN JON (1971) The 25 ton oil screw Ben Jon foundered October 15, 1971 in Kamishak Bay. BERG NO. 1 (1925) The barge Berg No. 1 was wrecked at Cape Saint Elias in 1925 and became a total loss. BERG NO. 1 (1935) The 42 ton 50 foot wooden scow Berg No 1 foundered off Cape Saint Elias May 2, 1935. No one was aboard the scow and no lives were lost. BERING (1966) The gas screw Bering foundered October 1, 1966 in Nelson Lagoon off of Deer Island. BERLIN (1922) The wood bark Berlin of 1,416 net tons stranded at Egegik Flats southwest of Naknek at 3:00 p.m. on April 17, 1922 and became a total loss. The 225 persons aboard were all removed to safety. There were about 1,400 tons of general cannery supplies aboard valued at $111,000, 75% of which were also lost. The vessel being “out of position” is listed as the cause. The steamers Nushagak and San Juan assisted in removing all those aboard. The steamer Akutan put a tow line on the Berlin but was unable to move the vessel. BERNICE (1934) The 15 ton 44 foot wooden gas screw fishing vessel Bernice was destroyed by fire July 15, 1934 at the Koggiung Cannery Dock on the Kvichak River in Bristol Bay. The three crewmen aboard made it to safety. BERTA J (1991) The 38 foot long line fishing vessel Berta J sank April 28, 1991 south of Yakutat. Very little evidence of the disaster was ever found. Two crewmen were lost; John Spears and Mike L’Ami. BERTHA (1915) The American steam ship Bertha stranded on a spit at the southern point of Harvester Island at 10 p.m. on July 18, 1915. On July 30th, still ashore, the vessel caught fire and was completely destroyed. The crew of 23, captained by Charles Glasscock of Tacoma, Washington, escaped. The 926 ton Bertha, valued at $40,000, and her 1031.4 ton cargo of lumber and building materials for a Bristol Bay cannery, valued at $11,500 were totally lost. The cause of the fire was believed to be the ignition of lime in the cargo hold. Cannery tugs from Uyak Cannery rendered what assistance they could. BERTHA (1985) The fishing vessel Bertha capsized without warning and sank April 29, 1985 off of Gore Point. All four crewmembers were rescued by the fishing vessel Wilson. BETTS (1964) The 12 ton 31 foot wooden gas screw fishing vessel Betts was reported lost in the Good Friday earthquake of March 27, 1964 at Kodiak. BETTY J (1956) The 45 ton 57 foot wooden oil screw fishing vessel Betty J foundered August 26, 1956 about 6.3 miles southwest of Yakutat. BEV ANN (1979) The oil screw Bev Ann foundered July 24, 1979 in Prince William Sound. BIDARKAS (60) (1799) One of the worst disasters in Alaskan waters occurred in 1799 when sixty bidarkas were caught in a sudden storm off of Cape Hinchinbrook and 200 men were lost. BIG DIPPER (1960) The 13 ton wooden oil screw Big Dipper foundered June 29, 1960 in Valdez Arm. BIG SEA (1981) The fishing vessel Big Sea sank while tied to the buoy in Port Etches on January 1, 1981. BILL (1964) The 12 ton 37 foot wooden oil screw fishing vessel Bill was destroyed by a tidal wave March 27, 1964 at Seward. BLACK AND BLUE (1994) The 26 foot longline fishing vessel Black and Blue grounded and was lost June 11, 1994 at Trinity Point northeast of Whittier. All three crewmembers made it to safety. BLACK CAPE (1964) The 10 ton 29 foot wooden oil screw fishing vessel Black Cape was destroyed by a tidal wave March 27, 1964 on Kodiak Island. BLAZER (1923) The American gas screw Blazer drifted onto the beach and broke up at 3:00 p.m. on Saturday, March 10, 1923 four miles southwest of Kanatak near Portage Bay on the Alaska Peninsula. The Blazer and a crew of three left Kodiak on March 6th bound for Kanatak and encountered bad weather near their destination. A heavy southwest gale sporting winds reported at eighty to ninety miles an hour managed to wash a coil of tow line off of the deck which found its way to the propeller. The crew attempted to clear the line from the prop but were unable and the “vessel drifted in on beach and broke up.” The crew survived the wreck. BLIGH REEF (2002) The 52 foot seiner Bligh Reef lost her steering and was abandoned in rough seas September 13, 2002 approximately 31 nautical miles southeast of Cordova near the Copper River Delta. The crew of the fishing vessel Snug Harbor attempted to tow the Bligh Reef but parted the tow line several times in the 15 to 20 foot seas. Both crewmen of the Bligh Reef abandoned ship to a life raft and were picked up by a U S Coast Guard Helicopter and transported to Cordova. BLIND FAITH (1978) The bowpicker Blind Faith was consumed by fire and abandoned May 22, 1978 near Pete Dahl Slough on the Copper River Flats. BLUE FIORD (1997) The 38 foot salmon seiner Blue Fiord flooded and sank when a circulation pump failed August 13, 1997 off of Evans Island in Prince William Sound. All four crewmembers made it to safety. Grosvold estimated the value of the Blue Fox at $12,000 and had no insurance. BLUE OCEAN (1964) The 68 foot Canadian halibut fishing vessel Blue Ocean out of Prince Rupert was lost April 8, 1964 during a blinding snowstorm and 80 mile an hour winds in Unimak Pass. The eight man crew abandoned the vessel on the beach during the storm. BLUE OX (1997) The 32 foot longline fishing vessel Blue Ox foundered August 14, 1997 approximately 60 nautical miles southwest of Homer. All three crewmembers made it to safety. BLUE PACIFIC (1964) The 16 ton 37 foot wooden oil screw fishing vessel Blue Pacific was destroyed by a tidal wave March 27, 1964 at Seward. BLUE PACIFIC (1979) The 98 foot newly constructed crab fishing vessel Blue Pacific ran aground and was destroyed by wave action August 5, 1979 in Izhut Bay. There was no loss of life. BLUE SEA (1928) The 38 ton 56 foot gas screw fishing vessel Blue Sea stranded and was lost at Karluk July 1, 1928. The three persons aboard made it to safety. BLUEBELL (1965) The 14 ton 35 foot wooden gas screw fishing vessel Bluebell foundered June 17, 1965 at Whale Pass. BLUEBIRD II (1986) The cabin cruiser Blue Bird II sank May 16, 1986 near Harbor Island 32 miles southwest of Seward. Clinton B. Thorp (14) and Felton Trevino (15), two runaway teenage boys from Anchorage were lost with the Bluebird II which they had stolen. BOBOLINK (1948) The 16 ton 37 foot wooden gas screw fishing vessel Bobolink was consumed by fire at Naknek May 31, 1948. BOGDAN (1951) The 15 ton 39 foot wooden gas screw fishing vessel Bogdan was lost January 20, 1951 when she blew away from her anchorage and drifted toward Mountain Cape on Nagai Island. BOHEMIA NO 1 (1905) The lighter Bohemia No. 1 was lost at Naknek in 1905. The value with cargo at the time was reported at $10,500. BOL (1930) The wooden gas screw Bol ran up on Strawberry Bar at dusk on September 8, 1930 and became a total loss. Ole Peterson, master of the vessel, and his one crewman made it to shore in a skiff. A strong breeze and heavy ground swell thwarted their effort to get the Bol off of the sand bar. They were on a trip from Cordova to the Bering River when the casualty took place. Estimated value of the vessel was $6,500 with no cargo on board. Peterson reported that he misjudged the channel crossing the bar. BONANZA (1960) The 38 ton 52 foot wooden oil screw fishing vessel Bonanza stranded and was lost September 29, 1960. 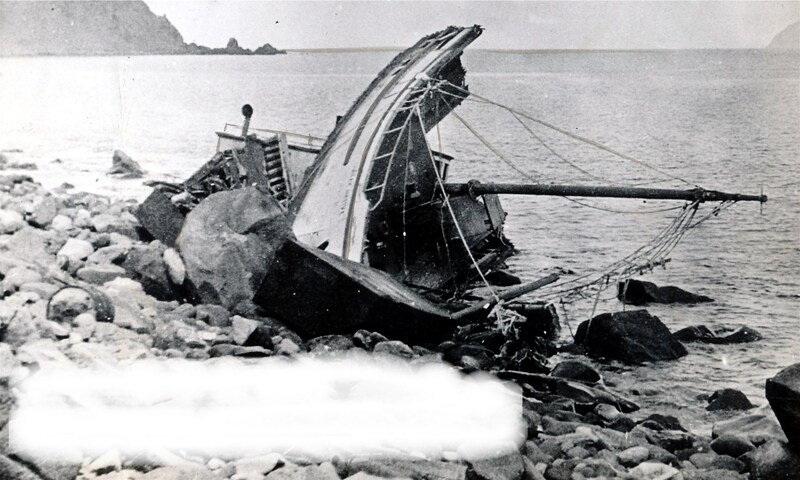 She struck a reef and sank at Nagai Rock near Chirikof Island. Cannery personel helped tow the vessel away from the dock and furnished medical aid to one of the Bonita’s crew that was injured. The Bonita was valued at $5,000 at the time of the accident. BONNIE GALE (1998) The 33 foot salmon gillnet fishing vessel Bonnie Gale flooded and sank in heavy weather May 18, 1998 at the mouth of the Copper River. The only person on board made it to safety in the 60 knot winds. BOTTOM LINE (1984) The 98 foot trawler Bottom Line sank November 13, 1984 approximately 50 miles south of Cape Chiniak toward the south end of Kodiak Island. Her five crewmembers went into the water in survival suits and were rescued by three Polish fishing vessels. BOUSSOLE (yawl) (1786) The French explorer LaPerouse led a scientific expedition of the two frigates, Boussole and Astrolabe, and lost a small yawl at the mouth of Lituya Bay July 11, 1786. The vessels had departed Brest, France August 1, 1785 on a scientific circumnavigation of the globe. 11 men perished in the accident. BRANDY (1991) The 34 foot fishing vessel Brandy was consumed by fire and sank August 10, 1991 at Anchor Point. BRANT (1961) The 44 foot diesel fishing vessel Brant was lost with all hands November 1, 1961 off of the north coast of Kodiak Island. The vessel was traveling from Larsen Bay to Port Bailey when she disappeared. Three crewmembers lost with the Brant were skipper Henry Brusco of Rainier OR, Jack Hauten of Rainier OR and Tom Curren of Kodiak. BRISTOL (1977) The fishing vessel Bristol swamped and sank July 25, 1977 on Long Sands Bar in Nushagak Bay. BRISTOL STORM (1996) The 117 foot crab fishing vessel Bristol Storm flooded and sank November 4, 1996 in 38 fathoms of water northwest of Port Moller. Winds were blowing at 35 knots and seas were to 17 feet with weather deteriorating. Water began filling the vessel’s pump room and could not be controlled. The Bristol Storm sank bow first. The flooding was thought to have been caused by a possible crack in a weld joint. All 6 crewmembers were rescued by the fishing vessel New Venture and taken to Dutch Harbor. BRITTANY KAYE (2003) The 29 foot herring gillnetter Brittany Kaye struck a rock and sank April 29, 2003 in Kulukak Bay, 60 miles southeast of Togiak. Both crewmembers made it to safety. At last report this vessel was sitting on the mud at low tide but was not refloatable. three miles south of Glacier Island in Prince William Sound. The 5 persons on board were picked up by the Glacier Queen and Lulubell. The survivors had only 4 life jackets and had been huddled around the 5th person until rescued from the icy waters. BROWNIE (1968) The gas screw Brownie was consumed by fire August 16, 1968 in Tonki Bay. BRUNVOLL (1928) The 56 foot wooden diesel screw halibut schooner Brunvoll disappeared with seven crewmembers on board somewhere southwest of Middleton Island. She was last seen November 15, 1928. The gas schooner Imperial went missing with 6 crewmembers on board during the same severe storm. Lost with the Brunvoll were skipper and owner Charles Bloomquist of Ketchikan, Jens Peterson, Pete Lindal, Louis Johnson, Magnus Larsen, Fred Lundquist and Elnar Rolfson. BUFFALO (1918) It was a very foggy thick dark night May 4, 1918 when George Hogg of Seward, owner operator of the gas powered sloop Buffalo, struck a reef just north of Cape Resurrection and stranded. Hogg was the only one aboard the vessel having left LaTouch earlier that day laden with about $400 worth of salt fish and barrels. He managed to float the Buffalo off of the reef and beach her in shallow water. The vessel, valued at $2,500 to $3,000 became a total loss because of heavy swells, but the engine was saved. Hogg filed a wreck report at Seward June 28, 1918. BULLDOZER (1964) The 13 ton 33 foot wooden gas screw fishing vessel Bulldozer was destroyed by a tidal wave March 27, 1964 at Valdez. BUZZARD (1990) The 25 foot fishing vessel Buzzard sank April 29, 1990 off of Naked Island. All three crewmembers were rescued by the fishing vessel Breaker. BYDARKY (1916) The coal barge Bydarky was blown ashore in a storm while anchored at Bluff Point Coal Mine in Cook Inlet at 2:00 p.m. on September 4, 1916. The barge, valued at $2,500 and her 90 ton partial load of coal valued at $750 were lost when both anchors drug free and the Bydarky stranded a mile in from her anchorage. Built as a gas boat in 1910, the vessel was converted to a coal barge in 1914 with her engine taken out and house torn down. The wreck report was filed by her owner I A Herbert of Seldovia.